My friend Bill Garcia told me at a Northbrook Chamber Meeting that he was bored with chicken breast. He wanted some inspiration and a recipe to overcome this food fatigue. I put together this dish on a whim, wrote down the ingredients and method on a piece of parchment. The rest is history. Enjoy! 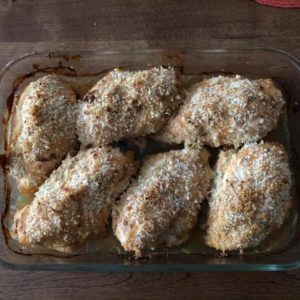 Poke Chicken breasts with the tines of a fork to tenderize. Mix yogurt, chopped chipotles and salt until well incorporated. Roll chicken breasts through marinade for 30 minutes. Place marinated chicken breasts in a Pyrex pan. Top with excess yogurt mixture. Combine Panko and Parmesan until thoroughly mixed. Spread evenly over chicken. Bake on lower rack @425F for 20 minutes. Rotate pan and lower oven to 375F and bake for another 20 minutes. Check for doneness. Remove from oven and let rest for 5-7 minutes before serving. Serve with chilled Arugula and sliced cucumbers.